The principal disadvantage is blurring, whereby out-of-focus signal from thick self-luminous cells and tissues stained throughout with fluorescent stains and markers, significantly reduces the signal-to-noise ratio and makes collecting a sharp in-focus image difficult or impossible. 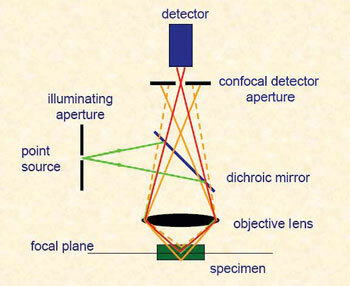 The confocal microscope is so called because the illumination pinhole, the plane of focus within the specimen and the detector pinhole are all situated at conjugate focal planes (see the ray diagram). By restricting the illumination to a pinhole, rather than illuminating the entire field of view at once it becomes possible to build up a blur-free image in three dimensions.The entire image is built up point by point in each frame, like reading words in lines along a page of script, and down each line on the page. Each frame (i.e. page) corresponds to a plane in the z-axis. These sections through the cell or tissue slice can be collected non-invasively. It is not necessary to physically slice up the specimen to reconstruct it in three dimensions. Because light is used to image each ‘optical section’, these will be in perfect register and so can be reconstructed into a three-dimensional model with ease. A computer is used to control the sequential scanning of the sample, building up the image point-by-point for display onto a video monitor. This is very versatile: an entire Z-stack can be collected in focus throughout; single ‘optical sections’ can be collected and 3-D projections of cells and tissues examined. A typical 2-D frame scan representing a single optical slice within the thickness of tissue may consist of 512 lines each comprised of 512 points, that is: 262,144 points overall which are represented as digitised pixels. In order to scan this 2-D frame in 1-2 seconds, the laser must dwell over each point – and have the emitted signal detected – in about 5 microseconds. A photo-multiplier tube (PMT) is used to enhance the weak signal and read it very rapidly; PMTs are very sensitive, but have a low quantum efficiency (QE) of converting the photons of the emitted fluorescent signal into photo-electrons. The PMT is therefore fast, much faster than the charged-coupled device (CCD) cameras employed elsewhere in microscopy and photography. It is rather like speed-reading the words on the page, and missing several in haste. However, speed in detection comes at the price of efficiency: a PMT has a QE of 12-15% at best, and so only detects 1 in every 7 or 8 photons of fluorescent signal. (a) First, illumination is delivered in parallel to all regions of the sample simultaneously, eliminating pixel-to-pixel differences in delivered illumination. 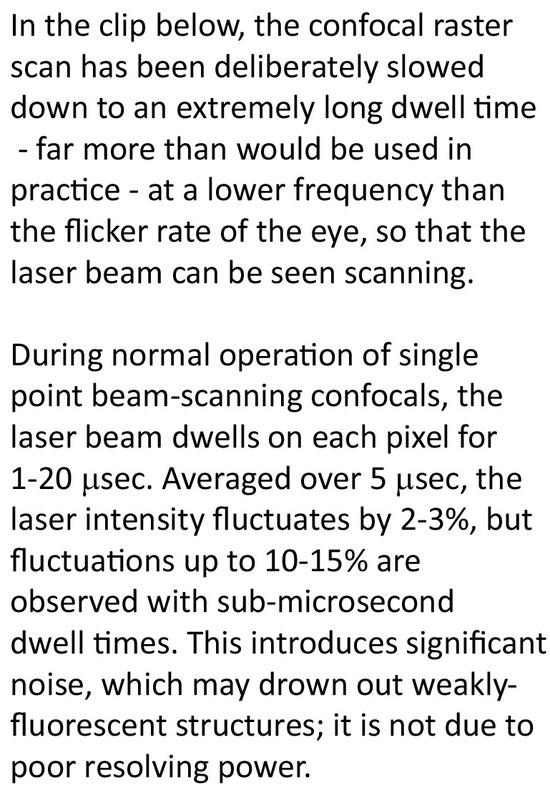 (b) Second, the CCD has ≈ 5-fold higher detection efficiency than the photomultiplier tubes of the laser-scanning confocal microscope, increasing the number of detected photons by 5-fold, thus reducing the Poisson shot noise by a factor of 2.24 for the same total illumination. (c) Thirdly, the CCD read-out electronics add less noise to the signal than the LSCM electronic circuitry. There are sources of noise in LSCM: (i) the gas lasers themselves, (ii) the LSCM detector electronics, and (iii) the fiber optic coupling of laser to microscope. 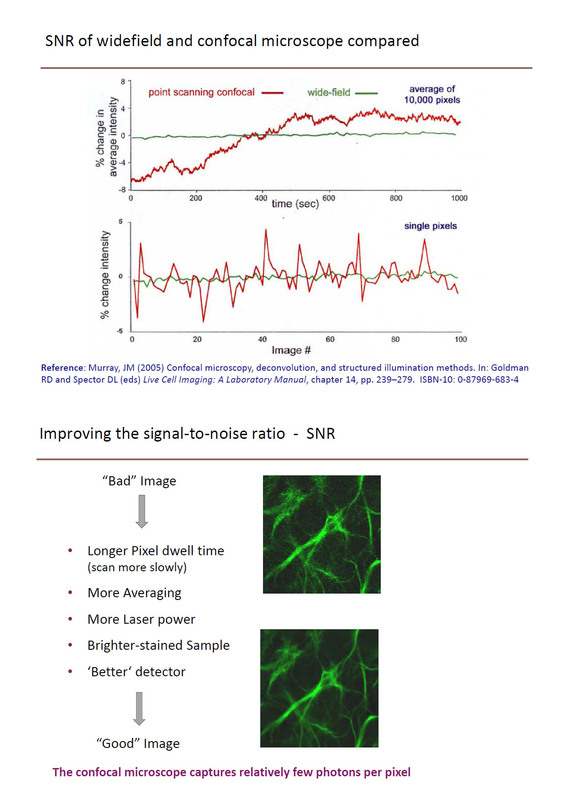 Because the confocal point-scanner illuminates the sample point by point and detects the descanned signal point by point through the cofocal pinhole, in order to collect sufficient signal it normally cannot scan faster than about 1-2 frames per second. It is therefore important that samples for confocal microscopy should be well-stained. 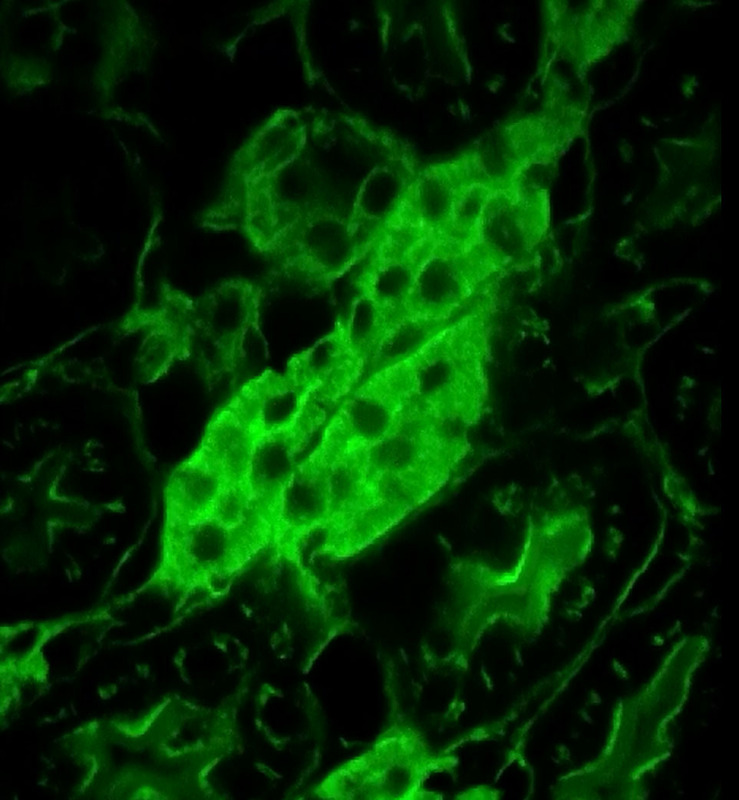 The point-scanning confocal is best suited to collecting images from relatively thick (20-100 mm) well-stained cells and tissue slices. In order to get high frame rates to capture living samples, the Nipkow disc , or spinning disc confocal, has been developed. 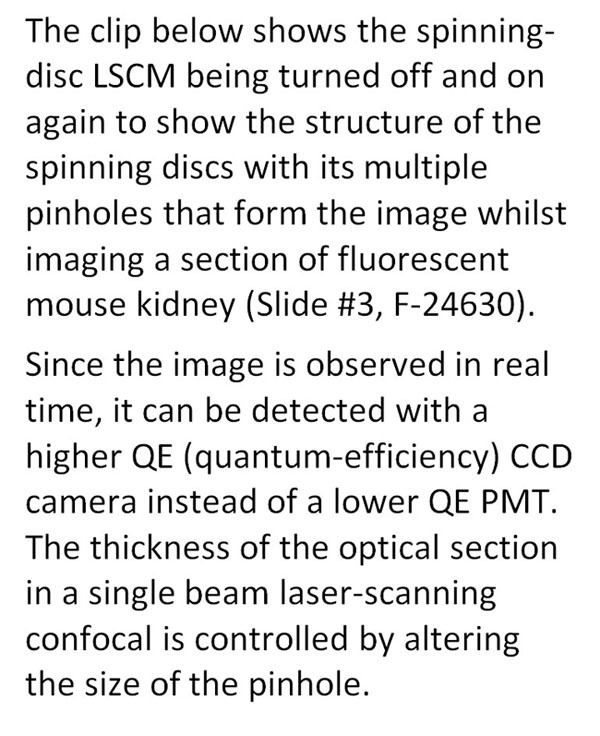 The design of the modern spinning disc confocal illuminates the sample with at least 1,000 multiple laser beams covering the field of view at any one time, formed by shining a laser through an array of 20,000 very fine (30 μm diameter) pinholes arranged helically in a rapidly-spinning disc (the Nipkow disc). However the pinholes in the early Nipkow disc design only occupied 1% of the area of the disc. The small holes in the early model tandem scanning spinning discs attenuated the illuminating beam so severely that fluorescence could not be detected except with the very brightest specimens, and this negated any speed advantage in capturing high frames rates because of the longer exposures demanded. A second disc aligned above the Nipkow disc carries micro-lenses to focus the illuminating laser light onto the pinholes. Each individual microlens is matched, and focused onto, one pinhole of the Nipkow disc. The light transmission rises to about 60%, making it possible to image fluorescently-labelled living cells in real time. The emitted fluorescent signal returns through the Nipkow disc, and is directed via a dichromatic beam splitter to a very sensitive EM-CCD camera (which allows very low exposures of weak signals). Since the image is observed in real time, it can be detected with a higher QE (quantum-efficiency) CCD camera instead of a lower QE PMT. 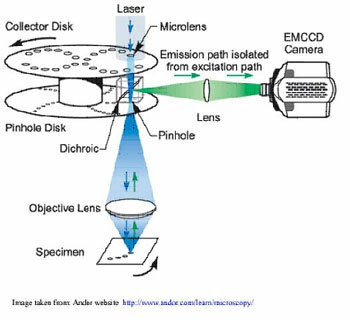 The thickness of the optical section in a single beam laser-scanning confocal is controlled by altering the size of the pinhole. In the spinning disc microscope the size of the pinholes are fixed, and are calculated to give confocality only for a 100x NA 1.4 objective, yielding an optical slice of 0.8 μm. It is also not possible to zoom in and out, as can easily be done with a single beam point-scanning confocal microscope. Because some light reflected, or emitted, from the sample will reach the detector via pinholes other than the one intended, some bleed-through, or cross-talk, may occur. For this reason, single beam laser scanning confocal microscopes and parallel beam spinning disc confocal microscopes are complementary technologies, not mutually-exclusive alternatives to one another. 1. There are two very useful chapters in Jim Pawley’s Blue Bible. 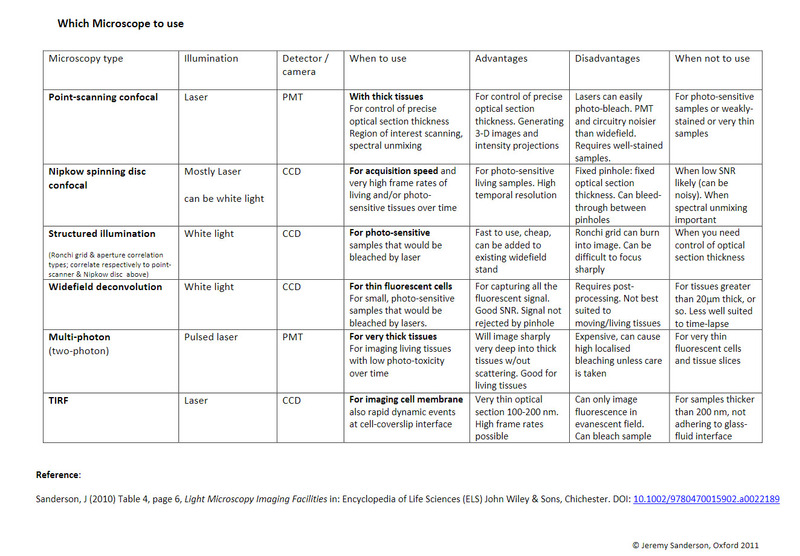 Centonze, V & Pawley, JB (2006) Tutorial on Practical Confocal Microscopy and Use of the Confocal Test Specimen. Chapter 35, page 627-649. Hibbs, AR; MacDonald, G & Garsha, C (2006) Practical Confocal Microscopy Chapter 36, page 650-671. 4. Conchello, J-A & Lichtman, JW (2005) Optical Sectioning Microscopy Nature Methods 2(12):920-931. 6. Gräf, R et al (2005) Live Cell Spinning Disk Microscopy, Chapter 3 in Advances in Biochemical Engineering & Biotechnology (Microscopy Techniques). Editor: J Rietdorf; vol 95: 57-75. Springer. ISBN = 3-540-23698-8. 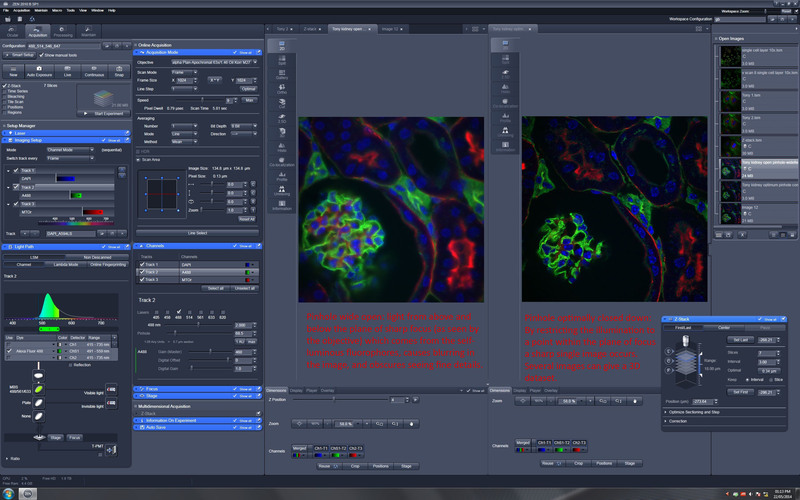 Click on the image below of the screengrab of the confocal microscope software to see two images of optical slices from a 20 um kidney section. The left-hand image is blurred because it has been taken with the pinhole wide open, approximating a widefield microscope. The right-hand image has been taken with the pinhole closed down and properly set to give a sharp optical section.